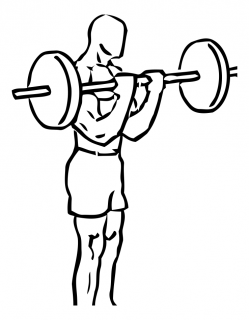 · Grasp an EZ Curl or barbell with palms facing up. · Standing with your feet shoulder width apart and your knees slightly bent, draw your abs in. · Extend your arms so the bar rests in front of your thighs. · Bending at the waist, bring the bar down to just above the floor. · As you return to a standing position, bring the bar up and curl your arms bringing your forearms to your biceps. · Return the starting position and repeat.